I have fallen seriously behind in my critiques of Mgr Basil Loftus' tiresome scribblings, because of the Summer School, Evangelium Conference, and on-going preparations for the LMS Walsingham Pilgrimage. But since I have been writing (in part in response to him) on Pius XII's views on Tabernacles and Altar, this letter of his in The Tablet, published on 3rd August, is too good - or bad - to miss. The Reservation of the Blessed Sacrament is the greatest single obstacle to the proper celebration of the liturgy in very many of our churches. 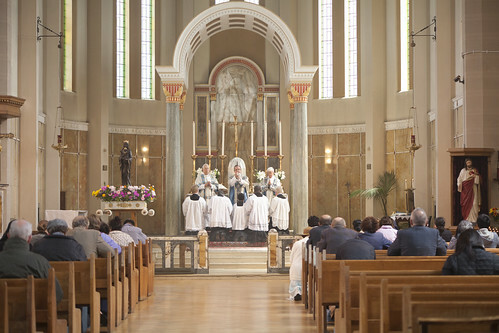 Many were built as shrines to the reserved sacrament rather than as spaces for eucharistic assemblies, and the vast sanctuaries, keeping people at a “respectful” distance from the tabernacle, to which all eyes are drawn, easily become even more disproportionate when they are “extended … into the crossing or even the nave” (Parish Practice, 27 July). Daniel McCarthy’s splendid suggestions about the readoption of an ambo go a long way to resolving the problem of “a place for everyone”, but will only succeed if the concept of an ambo as an “empty tomb” is seen to trump that of an occupied tabernacle. One of the consistent features of Loftus' output is that as well as being theologically wrong-headed, he makes the most ludicrous historical claims. Shrines to the Blessed Sacrament? It sounds quite nice, but it's not accurate. 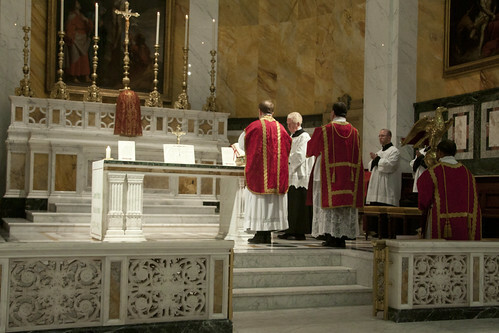 In cathedrals we have always had the Blessed Sacrament in a special chapel, where people can pray without distraction. 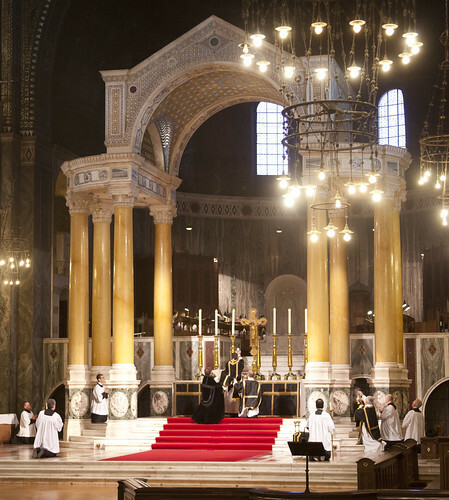 Look at the High Altar in Westminster Cathedral (above), and the High Altar at another fairly grand church, such as Our Lady of Willesden (which like the Cathedral has a baldachino: a little roof over the Altar: below), and the presence of the tabernacle clearly makes very little difference to the design or architectural focus. Westminster Cathedral's High Alter clearly wasn't designed as a 'shrine to the reserved sacrament': He wasn't there. So on what basis does Loftus say that a place like Willesden was? The focus, in fact, is on the Altar of Sacrifice, and it focuses attention on the sacred Action at that Altar, the Mass - which is, if you really insist on the terminology, the focus and apex of the Eucharistic Assembly. 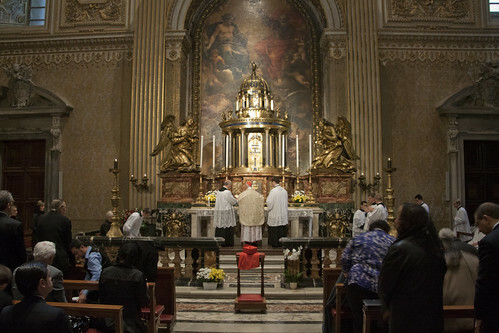 The Altar of Sacrifice is joined to the tabernacle, when it is joined to the tabernacle, and this is appropriate because it draws out the connection between Our Lord in the tabernacle and Our Lord in the Mass - as Pius XII explained. Moving down the scale of liturgical grandeur, we have side chapels which, again, have no tabernacles. 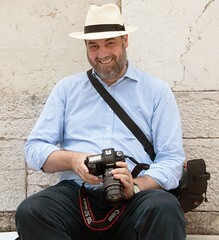 All the architectural features remain, on a smaller scale, to frame and focus our attention on the celebrant and what he is doing. One interesting and slightly strange modern phenonemon which I have encountered is the chapel without an Altar, and even exposition without an Altar; of course we are all used to seeing taberbnacles without an Alter anywhere near them, a biscuit-tin stuck on a wall. 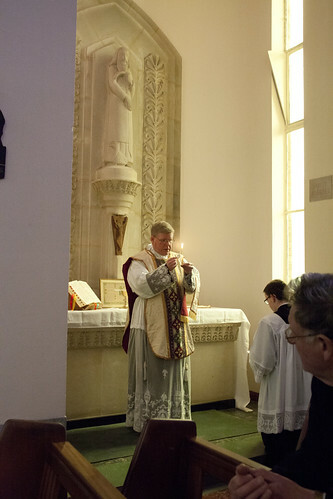 This reflects the liturgical modernist's desire to have as few Altars as possible, but the result is that it severs the connection between the Blessed Sacrament, the shrine, or devotional image, from the Mass, indeed from the liturgy. Does this reflect the insight of Vatican II, that the Liturgy is the Source and Summit of the Church's life? Oh but Loftus wants to end reservation altogether. He doesn't want us to be able to engage in contemplative prayer under the gaze of Our Lord in the tabernacle, like the peasant of Ars, who said to St Jean Vianney: 'I look at Him, and He at me.' Perhaps he doesn't even want people to have Communion on their deathbeds - it's not clear if a cupboard in the sacristy would be an acceptable substitute. It is hard to shed the idea that Loftus just doesn't like the Blessed Sacrament very much. He prefers the Empty Tomb. Well Our Lord didn't - He left it, after all. It is the tabernacle which He chooses to inhabit. ...and kneel between the open Communion Rail gates. I have other news for Loftus, however. The size of the sanctuary in older churches was not to keep people at a 'respectful distance' from the tabernacle. Anyone going into a small church, or the Blessed Sacrament chapel of a very big one, can see that a 'respectful distance' from the tabernacle in traditional church architecture is a couple of yards. No, these spaces were actually required for the celebration of Solemn Mass (and, in certain churches, for clergy or religious to sit in choir). 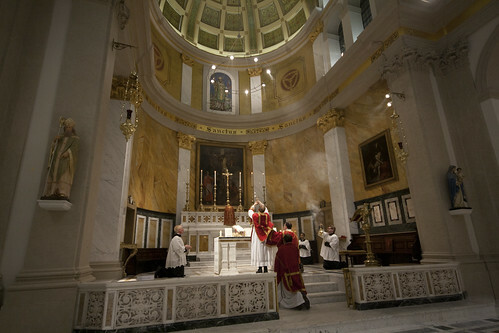 Loftus may have forgotten how this works, but, while Solemn Mass is possible in a smallish church, 'forward Altars' which reduce the room for manoeuvre in the sanctuary can hamper things considerably, as the above photos of St Patrick's Soho Square show. In the largest and grandest church in the whole world, St Peter's in Rome, what is deemed an appropriate distance between the Faithful kneeling in prayer and the tabernacle? See for yourselves: here it is, below. with Cardinal Castrillon saying Mass for the Una Voce General Assembly.